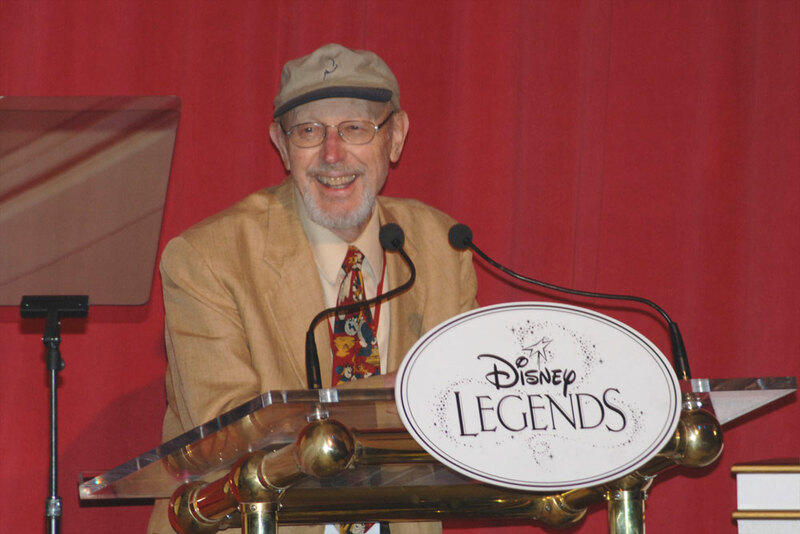 On September 20, Disneyland honored 18 individuals by awarding them with the prestigious Disney Legend awardsfor their imagination, talents, and dreams that have become an integral part of creating and contributing to the Disney magic. Before the ceremony, many past honorees gather in the foyer of the Opera House. 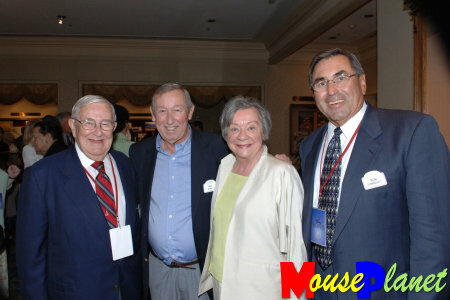 From left to right: Jack Lindquist, Roy E. and Patty Disney, Ron Dominguez. Photo by Frank Anzalone. 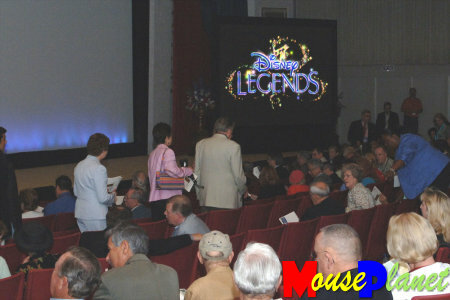 Themed to Disneyland's 50th anniversary, the event, held for the first time in its Main Street Opera House, specifically acknowledged those who contributed to the park. The inductees came from all areas, including artistry, music, attractions, custodial, community service, administration Imagineering, hotels, foods, and merchandise. Family and friends fill every seat in the Opera House to witness the celebration. Photo by Frank Anzalone. 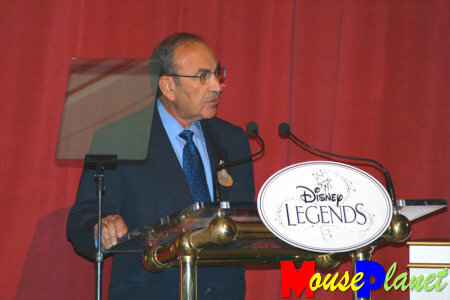 Marty Sklar, Disney Legend and president of Imagineering, officiates the event. Photo by Frank Anzalone. as a reminder of the gifts of those people who know the secret of making dreams come true. 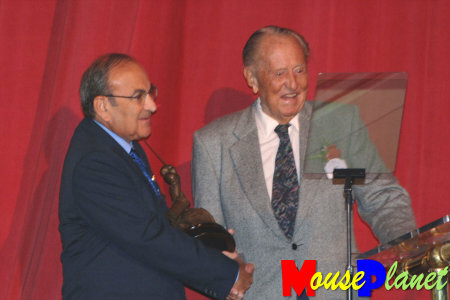 Marty Sklar presents television personality Art Linkletter with the first award. Mr. Linkletter was part of Walt's team that originally dedicated the grand opening of Disneyland in 1955. Photo by Frank Anzalone. The wand and the star represent magic: the spark that is ignited when imagination and skill combine to create a new idea. 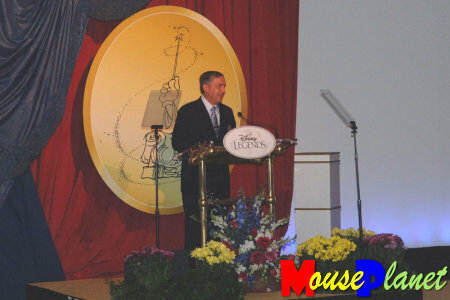 The President of Disneyland, Matt Ouimet, also participates in introductions and award presentations. Photo by Frank Anzalone. Hideo Indian Aramaki's son accepts the award on behalf of his father. Photo by Frank Anzalone. Hideo Aramaki came to Disneyland in 1964 and started as the chef at the Tahitian Terrace. 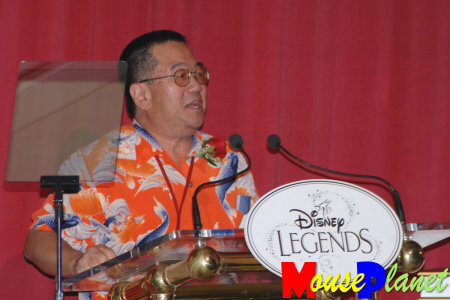 During his years with Disney, he trained many chefs at Disneyland and Walt Disney World. 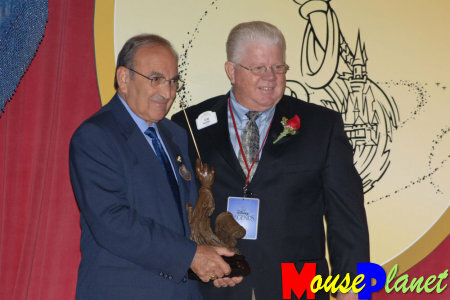 Tom Nabbe accepts the statue from Marty Sklar. Photo by Frank Anzalone. then became Tom Sawyer (and was on the cover of Parade magazine in 1957 as The Luckiest Boy in the World). Tom is a member of Club 55, the group of original cast members named for Disneyland's inaugural year (the chief qualification for membership: a paycheck from Walt Disney dated 1955). Cicely Rigdon began at Disneyland as a ticket seller and in 1959 joined the tour department. 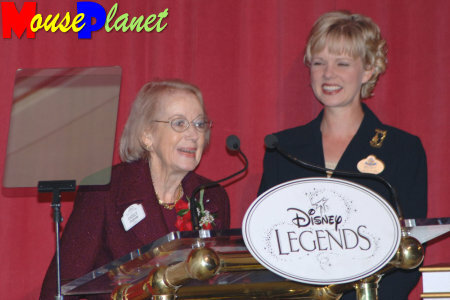 In 1982, she developed the Ambassador Program for Disneyland. Photo by Frank Anzalone. 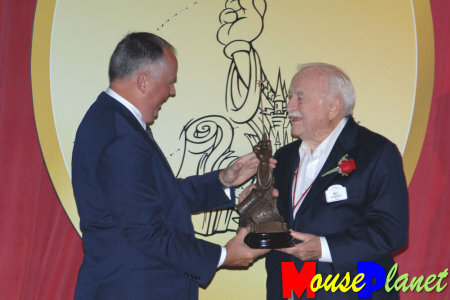 Milt Albright accepts his Disney Legend award. Photo by Frank Anzalone. 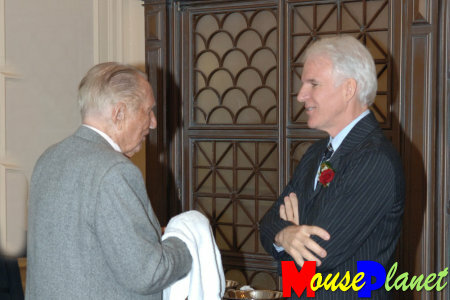 Milt Albright has the distinction of being Disneyland's first employee. He began his career at the company in payroll department at the studios and in 1953, decided to venture out and submit a design for an Autopia ride vehicle to Walt. Walt was not impressed with the design, but was very impressed with Milt and in Spring 1954, Milt was assigned to Manager of Accounting for Disneyland. Of the many positions he held, he was promoted to Manager of Guest Communications, a position he held until his retirement in 1992. Photo by Frank Anzalone. A Disney Legend himself, Wally Boag introduces his favorite comedian, Steve Martin. Photo by Frank Anzalone. When he was a young 15-year-old, Steve Martin used to go to the Golden Horseshoe Review all the time (because it was free!) and watch Wally Boag do his magic. It was the first live performer he had ever seen, and Steve studied Wally's humor and timing. Steve pays tribute to Wally as being a huge influence in his life and his career. Seen here in this photo, Wally had a hard time with the scripted teleprompterhe is just very good at extemporaneous banter. Steve Martin takes the podium. Photo by Frank Anzalone.  (said in good jest between good friends). Steve began his Disneyland career at the age of 10, selling guidebooks at the front gate. He spent three years at the magic shop on Main Street where he sold and demonstrated magic tricks and practical jokes. Steve Martin's career spans many facets of the entertainment industry, from a stand up comedian to a film star. His most recent film performance, as the host of Disneyland: The First 50 Magical Years, can be seen at the Opera House on Main Street, USA, Disneyland. 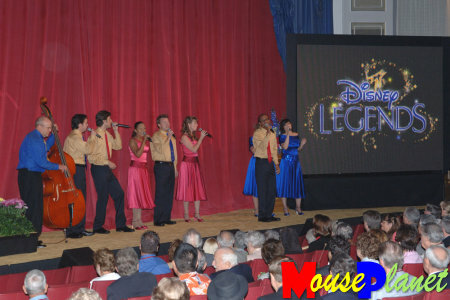 Entertainment cast members sing to the family and friends of the newly inducted Disney Legends. Photo by Frank Anzalone. Art Linkletter and Steve Martin, just after placing their handprints in cement, reminisce about their times at the Park. Photo by Frank Anzalone. Fifty years ago, Walt Disney had a dream that is now the Happiest Place on Earth. It took thousands of dedicated cast members to not only build that dream, but to keep it alive ever since. These honors are well deserved and on behalf of every guest that has walked through the turnstiles, we appreciate these tremendous efforts. Not even the pouring rain of the day could put a damper on this celebration. 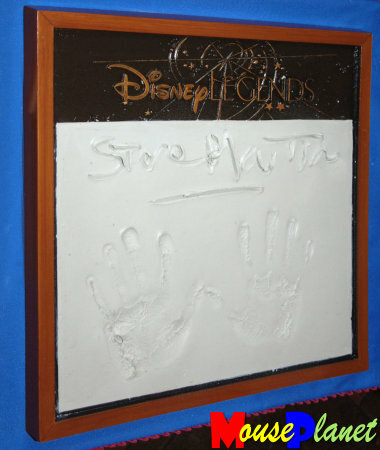 Here is the cement plaque of Steve Martin's freshly pressed handprints that will go into the Disney Legends Plaza at the Walt Disney Studios in Burbank. Photo by Frank Anzalone. 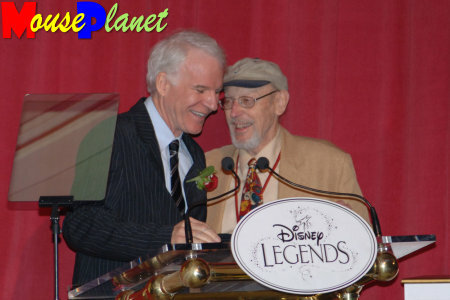 those individuals whose body of work has made a significant impact on the Disney Legacy!